You will be fishing from either a classic Mako 211 center console or an 18 foot Hewes Redfisher. We make the boat decision based on weather conditions and our fishing plan for the day. 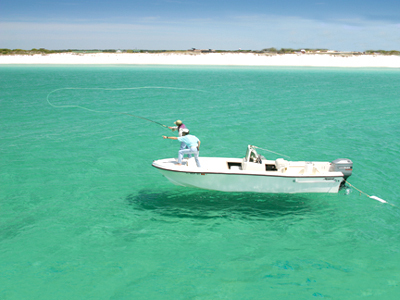 The Mako is a 21 foot “bay boat” customized for fly fishing. She has an 8 foot beam and is powered by a 225 Yamaha four-stroke outboard. The casting deck is large and sits 30 inches above the water providing an excellent angle for spotting fish. The bow is obstruction free with a pop-down cleat and no bow rail. From the bow, you can cast 360 degrees as there is no top to obscure casting to the stern. The second casting position is in the stern. We can safely store 8 fly rods. The Mako is ideal for our area as there are windy days that produce choppy Pensacola Bay waters. We have to cross this chop to reach our calm fishing spots, and the Mako always makes the ride comfortable. We also use the Mako for bottom fishing as the baitwell keeps menhaden alive for hours. The 18’ Hewes Redfisher is one of the finest shallow water skiffs ever made. 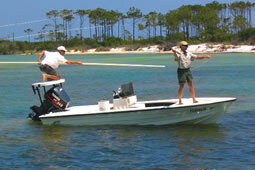 There is simply no better boat for poling shallow flats. When we have calm conditions and plan to fly fish or throw top-water plugs, the Hewes is our choice. Some of our best sight fishing occurs in the spring and fall on a north wind when we pole along the shore break in the gulf looking for pompano and redfish. The Hewes is perfect for this as well as poling inshore flats for trout and redfish. On days with glassy water, we will generally be in the Hewes.